… about Spain this year, then here is my recommendation. One of the downsides of Spain becoming so popular and so easy to reach over the past 10 years is that everybody who has spent a fortnight on a costa or eaten a great sea bass thinks they can write a book about some aspect of the country. Sadly a lot of the books are ill-written or penned by somebody whose knowledge of, say, Granada was from a long weekend under the influence of alcohol or who simply mugged up something from Google. 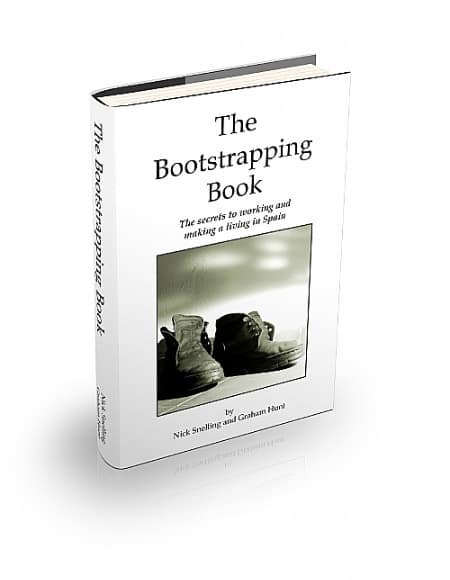 It therefore gave me great pleasure to read “The Bootstrapping Book” by Graham Hunt and Nick Snelling. Firstly, these guys KNOW Spain. They have lived here for a long time, are fluent in the language and how Spain “works”. Secondly Nick is an award-winning writer and journalist with a long list of well-received and critically acclaimed books and articles whilst Graham has brought up his children in Spain, seen them through the education system successfully and, indeed, recently saw off his daughter to university. Nick has a legal background whilst Graham has for many years proven that, yes, it IS possible to be an honest estate-agent. So, let me simply say one thing, “If you intend to read ONE book on Spain this year, ensure that it is “The Bootstrapping Book” by Graham Hunt and Nick Snelling”. This will give you a “guts and all” overview of Spain and what you need to do to make Spain work for you. Equally, if you expect and want to read about streets paved with gold and a land where success comes before graft, then this book is NOT for you. (Although you are the very person who SHOULD be reading it. Why? Nick and Graham have seen just as many broken dreams as I have. They have seen willing lambs to the slaughter in expatshire and they have seen people return with their tails between their legs and without the price of Ryanair Priority Boarding at Málaga or Alicante. Look, listen and learn would be my exhortation to you all. As always, I wish everybody luck but I can’t help feeling you will need an awful lot less 4 leaf clovers if you have read and studied “The Bootstrapping Book” cover to cover.